I think that in most companies, our alien friends would see lots of busy people, rushing around doing things: logging incidents, solving problems, building and testing changes, planning and releasing software and hardware. Once the aliens mastered the language and got through the “take me to your leader” ritual, they’d probably start asking people what they do, what’s their role. My expectation is that they would get answers like incident management, help desk agent, capacity management specialist, network manager, and so on. After a while, our friendly and inquisitive aliens would have a good understanding of what people in the ITSM teams do, but I wonder if they would understand much about why all that work was being done. Probably, they wouldn’t even notice any real services, which I know is ironic as it’s the service management department. I truly believe that even with their extra-terrestrial insight, they might have trouble seeing the link between all that bustle and actual service delivery. None of this comes about because the ITSM teams are wrong about what they do. They do it (and usually do it well) because it needs to be done. But the ITSM teams see the actual ITIL processes they do (they have a process view), whereas seeing why it’s done needs true service focus, meaning an understanding of the eventual outcomes. Service focus and process focus are not about different entities but are just two ways of looking at the same thing. Let’s look at a non-IT example to illustrate it: layer cakes. 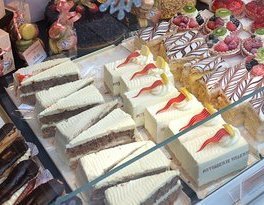 In a large bakery, there might be five teams working, one on each component – all specialists in their field – and maybe with sub-teams dealing with preparation, mixing, cooking etc. At the front of the shop, they’re selling sections of layer cake to customers coming in from the street. That end-service views the cake with a different focus and direction: they cut the cake up into tasty wedges, with each section comprised of all five parts of the cake. However it’s viewed, marketed, sold, and eaten as a single slice of cake, not as an assembly of pieces. When preparing the cake, we need to see the layers as separate parts, but when delivering the final product, it’s different. That’s when our focus must be on the integrated and scrumptious whole. It’s the same when creating and maintaining ITSM services – that’s when we need to see and build the process layers, but when delivering the service to our own customers, we need a more integrated view. So, maybe if our visiting aliens had landed in a cake shop they would have an easier time of picking up the basics of human society. But our ITSM team is who they’re with, so they’ll have to adapt and learn. From talking to ITSM guys, our alien friends will certainly learn what the IT services are made of, and how they’re assembled, but they won’t see why those services have value until they look at it from the business perspective, by talking with the customers (and business relationship managers) not the builders. The people with a business focus will see the business’ needs and how the services support those needs. They are much less concerned with the bits and parts of the service, or the internally focused processes that created it. Over the last 25 years or so, ITSM best practice has evolved from a functional team focus, through to a process focus, and finally to a service focus. It is too simplistic, however, to see this just as a series of replacements, meaning the service focus is not instead of seeing and understanding the processes, but needs to be done on top of that. We still need functional teams actually doing things. With the adoption of more integrated – and yes, more elegant – frameworks, such as Devops and IT4IT, it’s easy and tempting to throw the baby out with the bathwater and see any perspective other than service to be out of date and unstylish. That would be like the baker thinking only about the final cake – it’s not an efficient way to bake reliable, consistent cakes for a large customer base. So, make sure you know what the “end cake” looks like, who it’s for, and why it needs to look and taste good. OK, so maybe the services you manufacture, maintain, and deliver aren’t quite cake, but they serve a real purpose for your customers and you should be aware of that. But you can’t just make everyone into BRM specialists because you need folk who can build those internal processes, and that requires deep understanding of the technology and applications and how to get the best from them. To use my analogy, you want the baking skills in the kitchen that produce each layer of the cake, and the equivalent IT skills in your ITSM department to develop and maintain the processes that services depend on. As workforces age and retire, there’s a danger that organizations can lose that tight focus on specialist expertise. So try to actively protect and replicate it, as well as making sure your staff has sufficient awareness of customer needs. Be sure that, every now and again, those guys get out and see the world outside, the way other folks see things, and why some knowledge of that view matters to their own world. Then, when those enthusiastic aliens come asking questions, they’ll capture the why as well as the how when they quiz the ITSM folks.